Homework is sent every Friday. Y1 and Y2 children will be sent English and Maths. This homework will be linked to what they have been doing in class. It is designed to be supported so please help your child. If the homework has been pitched too high or too low then please put a comment on the homework to let the class teacher know. This half term indoor P.E. lessons will be taught every Thursday and will be taught by our professional sports coaches. Your child's kit needs to stay in school for the whole half term and will be sent home on each last day for washing in the holidays. Our kit consists of a white t-shirt, black shorts/leggings and black pumps. Reading books will be changed every Friday for all children. Please make sure to read the book with your children and make a comment of it in their Reading Records. 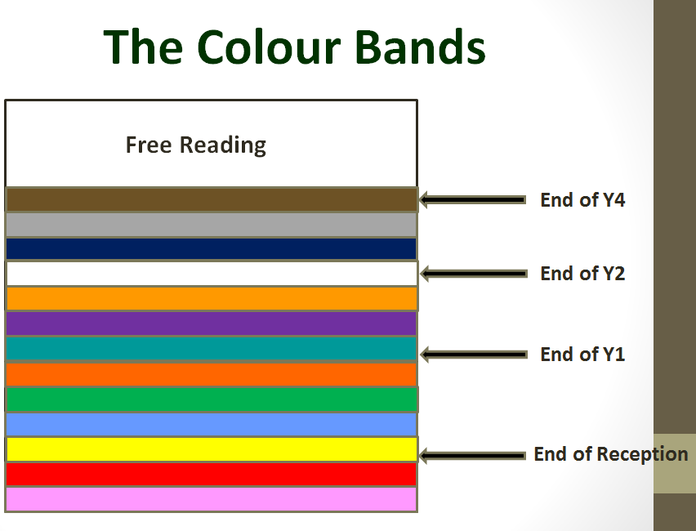 Below are the book band colours that we use in Greenfield and where children are expected to be for their age. If you have any comments about this please do not hesitate to contact the class teacher.